Colorado’s tech industry has grown steadily since 2012, according to the Bureau of Labor Statistics. As companies adapt to the needs of their employees by allowing them to work remotely, and as freelancers and consultants consider where to establish a home base, it’s no surprise that the quality of life in the Grand Valley is attracting those looking to escape the big-city hustle. These remote workers sometimes need access to a professional office setting — to conduct meetings, for example — but establishing an office space can be expensive, especially if it needs renovation. Although working from home may seem like a cost-effective way to do business remotely, it can come with its own unique challenges. Walden now works from 750 Main Street in Grand Junction. Once a Mesa County administrative office, the revamped building is now home to FACTORY, a coworking space that has been open since December 2016. Since its beginning, FACTORY has grown from 15 active members to 58. The open floor plan, separate conference rooms, unlimited coffee, and high-speed internet make it ideal for working professionals. One of the unexpected benefits that Walden discovered from working at FACTORY is the community of other digital marketers that he can seek advice from and socialize with. He says that rather than being competitive, they help each other. Coworking has opened new pathways for his career as well — he met his current boss there. “Opportunity exists here in ways you wouldn’t expect,” Walden notes. Coworking serves more than just the independent remote worker. 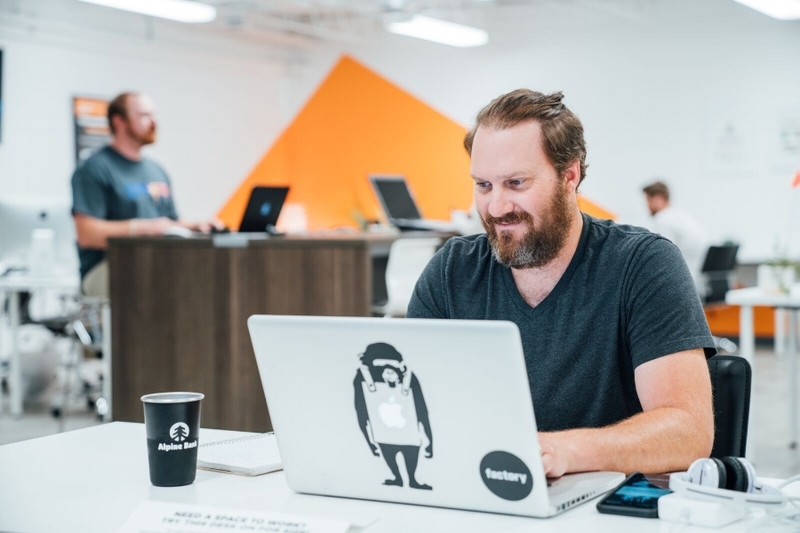 Founder of Growl Agency, Greg Olson moved his marketing company to Grand Junction from Denver in 2017. Since then, almost every new person that Growl Agency has hired was through networking at FACTORY. FACTORY creators believe in the idea of coworking so much, their desks are on the main open floor, despite the availability of corner offices. Founder Josh Hudnall says they are intentional about getting others to work together. They recognize that the model has the opportunity to foster relationships and meet certain needs of the community. By offering monthly events open to the public, such as Business After Hours, Lunch and Learn, and Book Club, community development is the foundation of FACTORY’s business plan. FACTORY’s success — and the lessons learned in bringing it to pass — led to Proximity, a parent business that came from the merging of FACTORY with Proximity Space, based out of Montrose. A 2018 Colorado Company to Watch, Proximity provides a platform for managing coworking spaces. Its network includes more than 100 locations across the country including several along the Western Slope. Coworking is already beginning to branch out into niche spaces, from FWorks in Fruita to Vault in Grand Junction. Located in an office building that used to be a bank, Vault applies the concept of coworking to the real estate world, creating a one-stop shop with marketing, drafting, insurance, bookkeeping, property management, lending, and investment companies all under one roof. Across the building’s lobby, a large, steel door lays open, and workers periodically bustle into the “vault room,” which now is home to the refrigerator and printer. A coffee bar is located adjacent to the vault door, tucked in a corner of the lobby. As an increasingly independent workforce seeks the elusive work-life balance, the convenience, flexibility, and connections offered by coworking are poised to serve them — and western Colorado — well.